Where’s all that Cataclysm farming gold durnit?!!! So, it’s been about 44 hours since Cataclysm launched here in the US, and I was ready and waiting. No, I didn’t flip anything like many bloggers I’ve been keeping up with, nor did I stockpile vast quantities of leveling mats and goods (Netherweave bags anyone?). However, I did take some advice from Kaliope’s Crafting Tome to get mining to 525 ASAP and hopefully turning a HUGE profit. 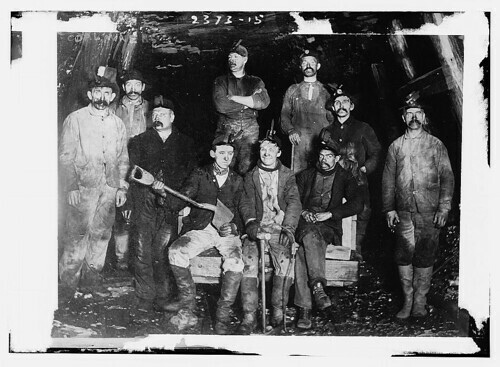 Even the “experts” all agreed that farming the first week or two of the expansion would reap huge stockpiles of gold for those who chose to do so. How wrong they all were?! (at least in the first 36 hours). There are many bloggers out there commiserating and a bit depressed about the weak returns. At least I didn’t invest capital into flipping or large quantities of crafting goods, because I would be sitting on a ton and losing my shirt! Back to mining: I took Kaliope’s advice and camped in Northrend after getting the mining glove enchant, purchasing Master Riding for 310 speed and then respecced frost to grab “On a Pale Horse,” which gives my toon an additional 20% mounted speed, much like a paladin’s Crusader Aura. That would effectively put me at 372% flying speed! After a frustrating 25 minutes of trying to login on launch night (to be expected, of course), I finally appeared in Dalaran. My trusty tauren DK was parked in front of the mining trainer, where I quickly picked up Grand Illustrious Mining, grabbed the same for blacksmithing, then headed to Krauss’ Landing to get Old World Flying for later. I then flew routes around Icecrown, Wintergrasp, and Shalozar Basin until I got to 470 mining skill (took about 15 minutes total). It was beautiful because there was no competition for ore in Northrend at that point. I then deathgated to Ebon Hold, mounted up, and flew south to Twilight Highlands to farm Elementium Ore, which requires 475 skill (remember my +5 mining glove enchant?). This served the great purpose of efficiency and lack of competition. I didn’t see another toon for the first hour in TH! I eventually saw several, but I had my pickings. I began to have visions of a realm first, but I ended up missing it by a paltry 15 minutes (thanks login server boss!). That’s ok, I was there to MAKE GOLD DARNIT! After reaching the mining cap, I just farmed Elementium, Rich Elementium, and Pyrite Nodes. In approximately 4 hours of farming, I netted 979 elementium ore, 79 pyrite ore, 6 rare gems, about 20 green gems, and about 200 volatiles (fire, water, earth). Now is when I tell you how my visions of extreme riches came crashing down. About an hour into farming, I had about 250 elementium ore. At that point I noticed someone spamming trade that they would pay 300 g per stack of elementium ore. I scoffed at it; literally laughed out loud at my screen at that preposterous offer! Oh how I wish I c0uld turn back time to jump on that offer. See, after I farmed up nearly 50 stacks of the stuff, I hit the AH to post, but not flood, the market with my mats for many riches, or so I thought. Elementium at that point was going for 90g/ore, translating into 1,800g/stack!! Even Basil B. himself thought ore could be going for 1-3k/stack in the first few days. So, I posted and went to bed for about an hour. The top graph shows market price. 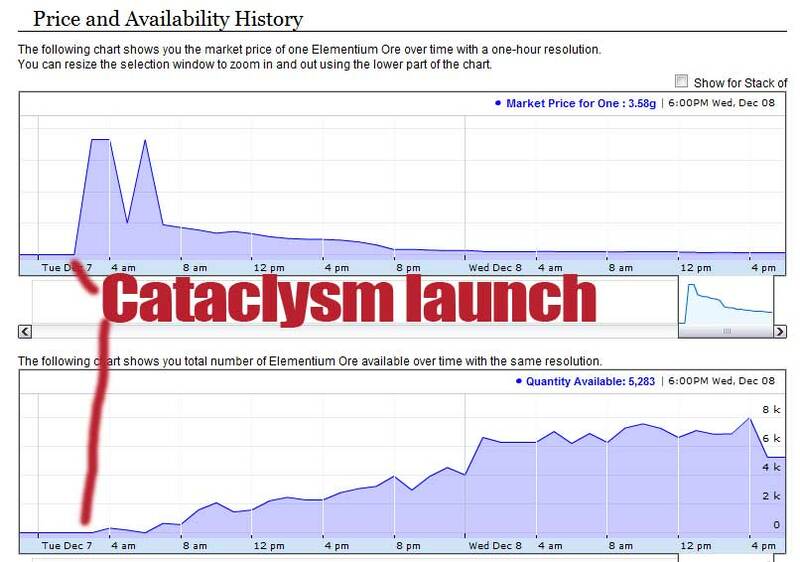 You can see the rapid decline to it’s 6pm, day 2 value of 3.58 g. The bottom graph is the number of elementium ore available…over 5,200!! Apparently everyone had the same idea! Despite the lower-than-expected gold making, I have still made over 5.7k gold by selling Cataclysm ore, gems, and volatiles…all in about 4 hours of farming for over 1k gold per hour. PLUS, I still am sitting on 800 elementium ore left over. I know, I know, you’re probably screaming at me to just dump that too…it’s pure gold, right? Well, that’s true, but if the floor indeed holds at 54 g/stack, and it’s at 58 g/stack right now, I may just keep the ore to level my blacksmithing instead of making a small margin to reinvest into purchasing these same mats for leveling 3 weeks from now. I will still keep a close eye on the market as I start leveling my main to 85…it’s always possible that there was an initial flood that will temper off into a moderate rise in market price, significantly above the gem vendor floor of 54g/stack.